When I was younger… (now get off my lawn) … I used to have band posters, stickers, and pictures of people and places plastered over almost every inch of my room. From the doors ♫ to the windows, to the wall ♫ on my mirror and even my ceiling it was a pretty straightforward expression of who I was and what I was into. I have not really been nearly as creative in my decorating since. When I settle down and buy a place I think that might be the first thing I change. Anyways, I know most developers and data scientists on their own laptops have the NASCAR like sticker set on their lids. I was always a little reluctant for some reason. One part I did not want to waste the stickers I put effort into collecting since it seems like I will always be trying to get new hardware. I think the other side basically revolves around wanting to appear at least somewhat professional in my corporate job. Well I travel with my Chromebook frequently and is starting to show some wear from all of that. Somehow that feels worse than it having stickers. I also recently got a bunch of h2o.ai stickers from H2O World New York. So I thought this would be a nice way to jazz it back up and have some fun with it. Figure it is worth capturing while it looks this nice. Who knows how it’ll hold up since I have more travel on my calendar over the rest of the year. Nice problem to have though. It may not be as completely expressive to all of my facets as my room was when I was younger, but I think it is a fun and fair representation of a lot of what I do in technology, big data, and data science. 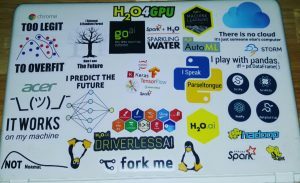 This entry was posted in Data Science, Just for Fun, Personal and tagged data science, Git, GPU, H2O, Hadoop, Hive, humor, just for fun, laptop, Linux, Python, R, Spark, stickers, talk nerdy to me, TensorFlow, there is no cloud just someone else's computer by chris. Bookmark the permalink.